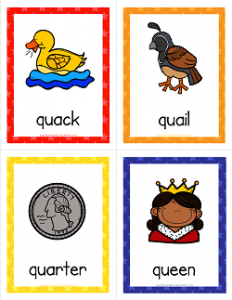 Here’s a few things that start with q right here on these quaint and colorful cards: quack, quail, quarter, queen, question mark, quill, quilt, & quiz. I say a few because that’s about all there is when it comes to words that begin with q. Be sure to point out to your kids that even though these words start with the q sound /kw/, they don’t start with just the letter q. They all start with the letters qu. That’s what’s special about q … it has a built in buddy!